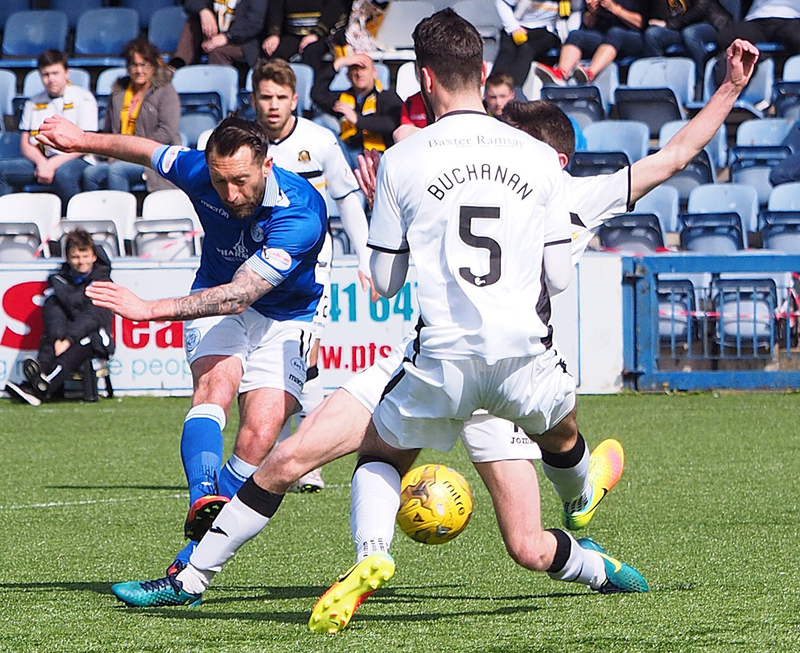 After successive games on the road, Queens returned to Palmerston for their penultimate home league game of the season and despite taking an early lead, the home support in the crowd of 1289 left the ground disappointed as they saw their team lose by the odd goal in three against relegation threatened, Dumbarton. The home side made 3 changes to the side that started against Hibs last time out, with Dale Hilson, and the two Connors, Murray, and McManus, coming in for Lyndon Dykes, Dom Thomas, and Dan Carmichael. On the bench there was a place in the matchday squad for Callum Tapping for the first time since September of last year. The on-loan McManus, making his first start for Queens lined up just in front of the back four as manager, Gary Naysmith, opted for a diamond formation. 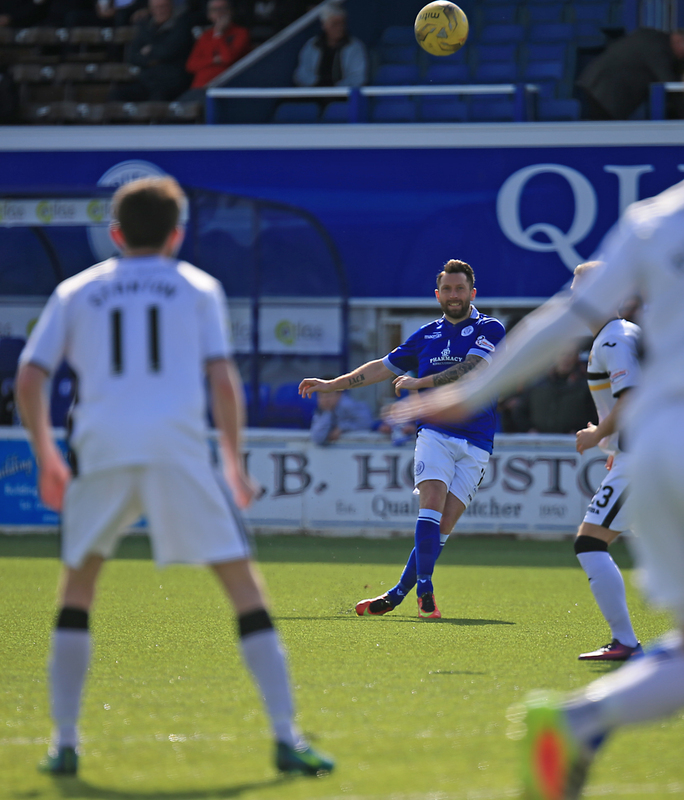 The opening period saw Queens begin well and Stephen Dobbie wasted little time in showing his intent when his low curling effort from the left forced visiting `keeper Martin to react well to push the ball to safety, and as the hosts continued to have the upper hand, a forceful run from Jordan Marshall found Murray in space and the youngster did well to get an effort on target which was once again well dealt with by Martin. A quick break through midfield by Stirling saw him create a shooting chance for himself, but thankfully for Queens his strike fizzed just over the bar, and just moments later Queens opened the scoring with what would turn out to be their best passing move of the game. 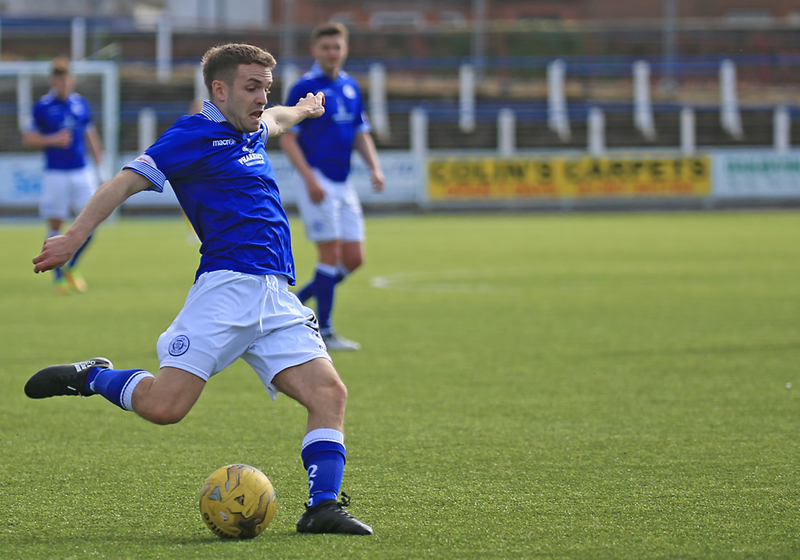 Connor McManus produced a fine long range pass that picked out Marshall and in turn Marshall`s cut back found Stephen Dobbie and although he was tightly marked, he was still able to turn and drive a powerful drive past the dive of Martin to score his 24th goal of the season. Having taken an early lead you might have expected Queens to go on and win the game comfortably, however that didn`t turn out to be the case, and arguably from the moment that they went in front things slowly but surely began to go wrong for the hosts, and less than five minutes later, the visitors had gained parity. John Rankin`s clumsy challenge on Vaughan some ten yards or so outside of the box gave the visitors an excellent chance to put pressure on the home defence, and they took full advantage of the situation when Stanton drove an effort over the wall and high into the top corner. The pendulum had began to swing in favour of the away team and as they slowly assumed more control of the game, Stanton tried his luck from much further out, but this time his ambitious effort was well off target, and minutes later following yet another free-kick, a low drive from Vaughan all along the ground was comfortably gathered by Lee Robinson as the visitors continued to look the more likely team to score. After having more of the possession in the opening period, Queens began to struggle to link their passes together and although on occasion McManus produced a few well placed long balls, it was in the final third of the pitch where Queens were having the most difficulty. They almost benefited from a huge slice of luck just past the half an hour period when Connor Murray`s cross from the left evaded everybody in the box and bounced back off of the far post, but Dobbie, from very close range, and with the angle narrowing all the time couldn`t get over the ball enough to keep it on target. Five minutes after that incident Dumbarton had turned the game around and their second goal came from more indiscipline from the Queens defence. This time a foul by Darren Brownlie just outside the box gave Dumbarton another set piece chance and although the initial delivery was repelled, Nade showed good skill to get beyond the Queens defence and produce a well flighted ball in from the right that was squeezed in at the back post by Robert Thomson. At that stage the visitors were good value for their lead as Queens had failed to make any real headway after going in front early on, and as the game reached the break no-one could argue that Dumbarton did not deserve to be ahead. There was a change for Queens at the start of the second half as Lyndon Dykes replaced Joe Thomson and for a few minutes early in the half, Queens were on the front foot. They were awarded an early free-kick when Dale Hilson was felled, but Dobbie`s delivery lacked accuracy and was easily defended. The hosts were starting to see more of the ball and certainly had the bulk of the possession, but far too often their passing was either sideways and/or backwards, and the frustration from certain sections of the support was clearly audible on several occasions. Just before the hour mark Queens won their first corner of the half, but the short routine followed by Rankin`s delivery was once again easily defended as another half chance slipped away. Gary Naysmith - in charge for his 20th league game - made a double change on 60 minutes when Dan Carmichael, and Dom Thomas, replaced Connor Murray, and Dale Hilson, unfortunately although Queens huffed and puffed for the remainder of the game, they failed to really put the visiting defence under enough pressure for sustained periods. Carmichael whipped in a good cross from the left that had no takers, and Dobbie and Dykes linked well to provide a shooting chance for Dobbie that was charged down, whilst at the other end, Chris Higgins displayed some excellent defending firstly heading clear a dangerous cross, and then producing a strong challenge to prevent Stirling from getting in a shot. 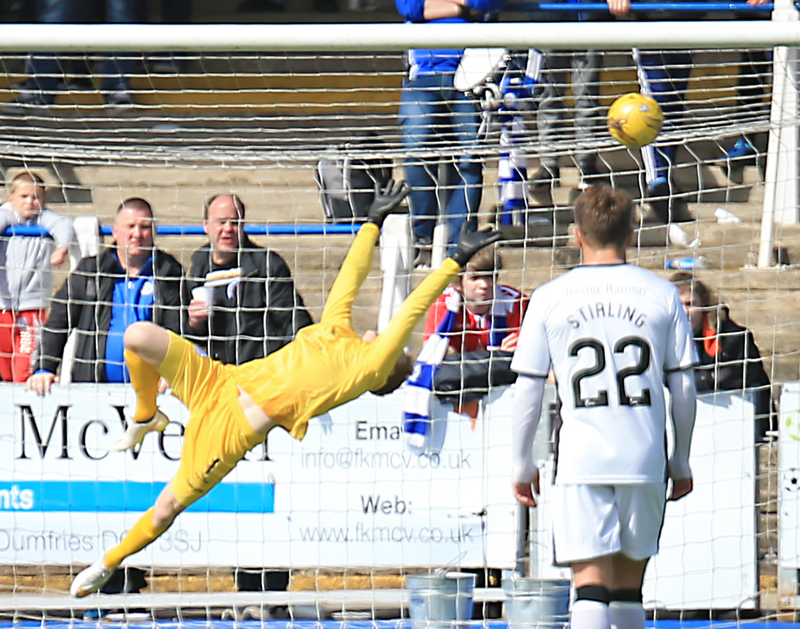 A quick break led by McManus ended with a half chance for Dobbie - his shot being deflected into the arms of the `keeper, and at the other end, a speculative effort from Thomson was well off target. With the game entering it`s closing minutes, Dumbarton had two really good chances to add to the score. Firstly a header from Buchanan following a free-kick by Stirling went close at the back post, and then Fleming got the better of Jacobs and saw his hooked effort from a tight angle go across goal and spin only feet wide of the far post. To complete Queens` misery, Jacobs was booked late on, and although the home side won a last minute corner for which Robinson made his away forward, unfortunately once more on the day Queens` delivery was not as good as it needed to be and the set-piece was comfortably dealt with. 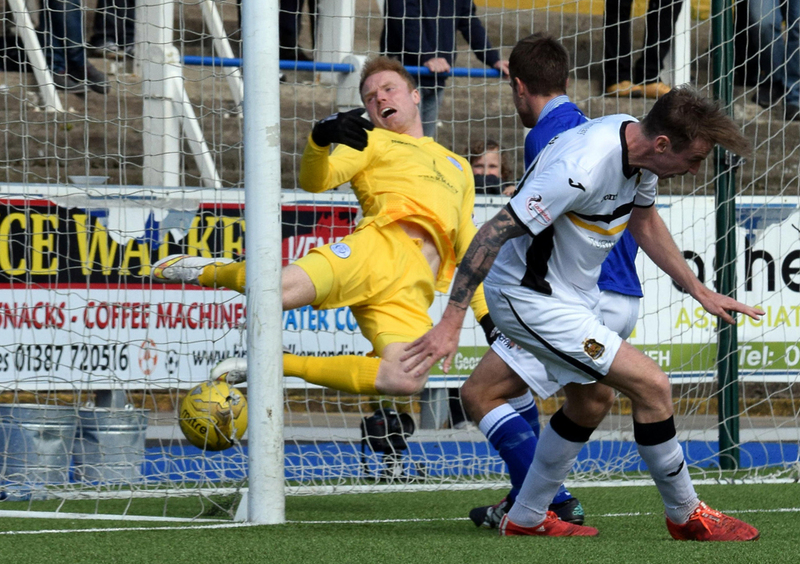 So for the second time this season Dumbarton left Palmerston with all three points as Queens slipped to their 8th home league defeat of this largely disappointing season. The one good thing from today is that it is now 100% official, Queens will be playing Championship football again next season. 14:55 Dumbarton xi; Martin, McCrorie, Buchanan, Carswell, Thomson, Stanton, Harvie, Barr, Stirling, Vaughan, Nade. 15:02 The teams are out and we`re only moments from kick-off. 1 min Dobbie has the first effort at goal but is saved by Martin. 8 min Murray fierce shot is palmed by Murray. Still 0-0 here. 14 min Stirling`s long range shot clips the bar. The Dumbarton players appeal for a corner but the referee waves away their protests Still 0-0. 19 min Rankin cautioned for a foul on Stanton. 20 min Stanton takes the free-kick and curls it past Robinson. Superb equaliser. 31 min Vaughan`s free-kick is easily collected by Robinson. Still 1-1 here. 35 min Hilson`s slides in, hits the Dumbarton post, Dobbie follows up with the rebound but skies it over the bar. 40 min Nade`s cross to Thomson at the back post and he heads the visitors into the lead. 52 min Corner to Queens. 53 min The corner comes to nothing and Queens still trail Sons 2-1. 64 min Rankin`s shot hits off a defender and spins into the hands of the keeper. 65 min Dobbie makes space, hits a strike straight at Martin. Still 1-2. 68 min Another Dobbie shot is parried away by Martin. 80 min Buchanan`s header flies over the bar.